For most of America, this is football season. But for F&W, it’s Top Chef season—the 11th to be exact, and it premieres on Bravo tonight at 10/9c. Along with the usual array of nail-biting and craving-inducing challenges, this New Orleans-based run promises a slew of great celebrity cameos from fried chicken-fanatic Questlove to Cajun cooking master Paul Prudhomme. 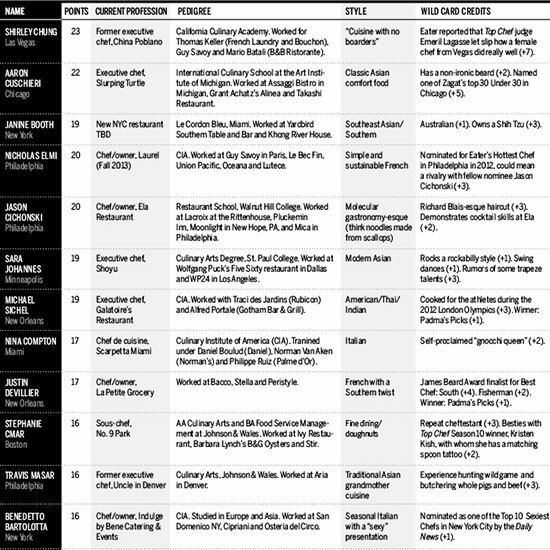 Before the show airs, print out or save F&W's Fantasty Top Chef Roster. Figure out a draft order by the usual means, such as drawing straws, picking numbers out of a hat, hosting a foot race or a marshmallow-eating contest. Then, draft your chef. After each episode, we’ll award points to chefs for winning challenges, impressive techniques, sassiness and other actions that might warrant a prize. If your pick packs his or her knives at the end of an episode, then you can still nab a free agent off the waiver wire. You can play for whatever you like within your own league—a dinner out, a great bottle of wine, bragging rights. The F&W League will be competing for a life-sized Tom Colicchio cutout.